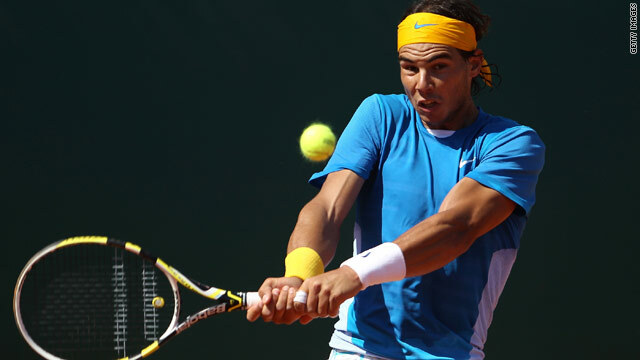 Rafael Nadal reached the quarterfinals of the Madrid Masters for a sixth successive year after beating John Isner. (CNN) -- Rafael Nadal and Andy Murray are both through to the last eight of the Madrid Masters after straight sets wins on Thursday. Second seed Nadal reached the quarterfinals for a sixth successive year after beating 13th-seeded American John Isner 7-5 6-4. Meanwhile, third seed Murray showed he is finding some form again after a poor season so far with a 6-2 6-1 crushing of Romanian Victor Hanescu. However, Nadal again looks the man to beat as the Spaniard aims to add the Madrid title to his recent Masters victories in both Monte Carlo and Rome. "It was a dangerous, difficult match," Nadal told the official ATP Tour Web site. "It's a match I'm very happy to win. I played well and took the chances I had, it was a very important win for me, I played much better than in the previous round." Nadal will next face 12th-seeded Frenchman Gael Monfils for a place in the semifinals of the tournament. Meanwhile, in the women's event, Australia's Samantha Stosur set up a clash with Venus Williams after defeating Swiss Patty Schnyder 7-6 6-2. Eighth seed Stosur has never beaten the older Williams sister in three previous meetings, but has won 14 of her last 15 matches on clay and reached the last four of the French Open last year.